I'm heading up to Virginia this afternoon for tomorrow's Swinging Bridge Runs. These are low key events held in the Cumberland State Forest with the start/finish area in Bear Creek Lake State Park. They are put on by the Richmond Roadrunners and directed by Kevin O'Conner and offer a 50K and a 35 K option. There used to be a 10 miler, that was closer to 11 miles, but it has been moved to a seperate weekend. I first experienced this race in Dec 2001 before my ultra debut in Feb of 2002. I went to run the 35K , which would be my longest trail run to date. It was a cold but beautiful day with perfect running conditions. There are several creek crossing and a wade across the Willis River. I learned that day to not worry about wet feet. I was going to try and avoid a creek crossing by walking over a fallen log. When a branch I was holding on to snapped I fell about 7 feet to the ground and had the wind knocked out of me. Fortunately I missed the water and decided from that time forward I would wade or swim or whatever it took to avoid that happening again. Had a great time and felt good all day. 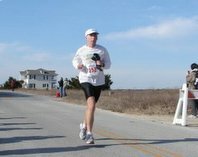 I went back in Dec. 2002 and intended to make this my second ultra with a 50K finish. Mother Nature conspired against me and most of the other entrants. It had snowed 7 or 8 inches earleir in the week and after melting, and refreezing for a few days we were left with a course covered in 2 to 3 inches of solid ice. Although I was in much better shape than the year before, the slipping and sliding and trying to run over broken, jagged chunks of ice slowed me down considerably. I was a full hour slower getting to the 35k point and Kevin wouldn't let me continue. I thanked him because I didn't want to have anymore "fun"anyway. I think 8 out of about 30 runners finished the 50K that day. I returned again in Dec. of 2003 because I like the trail and the race and I really wanted to get a 50K finish at his event. Once again Mother Nature had a surprise for us. A hurricane had passed over the area in Sept. leaving hundreds of trees fallen across the trail. Despite efforts by some locals to clear the trail we still had at least a 100 or more to climb over, under or around. But that was the least of our trouble. The creeks were also flooded and the temperature was about 30F. I was running with my friend Tom Smith when we came upon the first of several creeks. We were wading for about 100yds through ankle deep water, crunching through a layer of ice trying to follow the trail when we came to a group of 7 or 8 others stopped in their tracks. We could see the trail markers on the other side of the swollen creek but how to get there?. I picked a spot to try and taking the lead started across thinking it may be thigh deep but it came up to my chest. BRRRRR!!!!!! And to think I had to come back the same way. After a couple of miles we came to another flood plain and waded again to another crossing . It was only thigh deep but I slipped and was wet up to my neck. How did we survive before technical running clothes? Amazingly, even with the sub-freezing temperature, within minutes I felt warm and nearly dry. Tom dropped at 35 K but I was determined to get my 50K finish on this course so I continued on. Luckily the last portion of the trail only had a few downed trees and none of the creeks on this higher ground were flooded, just toe dippers and I was finally able to finish in 7:34. The next year the runs were moved to January on the same weekend as Carrboro so I haven't been back since then but with Carrboro moving two weeks earlier this year I am freed up to return. It is a truly nice run, but I will be taking the 35K option this year. I would love to do the 50 K but one of my top goals this year is a 100 mile PR at Rocky Raccon in two weeks so I am tapering. I'll have to keep this one in mind for next year. Thanks for talking about it and I hope you had a great run. Just a tad windy out today here in Maryland! Thanks Caren. It is really a nice trail. Lots of creek crossing and still a lot of fallen logs but mostly a very runnable course with no major climbs.It is a bargain at only $15. The aid statons are very adequate for a 50K and you get a pretty long sleeve shirt with a drawing of the bridge.